AUTOFEEL is a registered brand in the USA, and our TRADEMARK NUMBER is 86513972,our product is Factory outlets, absolutely authentic product.and we provides 1-year warranty. Does it bright enough to light up the way? High-quality chips and the combination of spot beam and flood beam create powerful and super bright ray to light up the forward dark road. Provides the perfect balance between beam distance and coverage area. It is popular for both highway driving and off-road because drivers can see the road ahead and beneath the wheels. Does it fit my vehicle. Our led light bars fit most vehicles(Off-road vehicle, Special vehicle, Engineering vehicles). But you need to measure the place where you want to install the light bar so that you can choose the correct size. Does the package includes mounting brackets? I want to install it above windshield. The package includes mounting brackets. But if you want to install it above windshield, you need to buy special windshield brackets. What's the material of the back cover? Aluminum housing rather than plastic housing. The light bar will be well protected by the aluminum housing. Ensure a long lifespan for your vehicles. Yes. The military breather and rubber bolt ensure a better sealing performance. It can work well even though going through a heavy rain. UNIQUE QUAD ROW DESIGN: The special 4 row design gives your car a sharp look and offers you an excellent night driving experience. As bright as day, makes you feel safe while in darkness. You can go through rough roads, drenched conditions, and the darkests of environments, this light will light up everything, what's in front, to the sides, or above. SPOT FLOOD COMBO BEAM: Our quad row led light bat is the combination of spot light 30 ̊ and flood light 150 ̊. These light bars will work perfectly as floodlight as they will light up everything in front of you, as spotlight as they will make you see anything clearly in front of you. With this it is easy to see obstacles from a distance and slow down appropriately without hard braking. 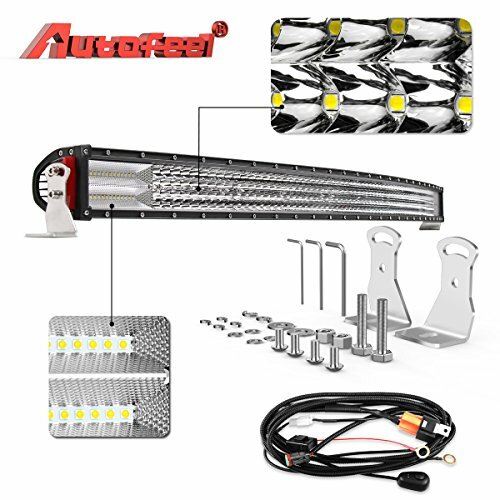 LED LIGHT BAR: With proper current control, they have a lifespan over 50,000 hours. Unlike cheaply made LEDs, LEDs do not fade early. Despite higher initial cost compared to other LEDs, in the long run they cost less to operate. 1 YEAR WARRANTY: Super fast shipping. Great packaging protects item from damage. It is worth every penny. It was a super bargain in comparison to other lights of the same size, and those were rated for less lumens. We also offer 1 year warranty and lifetime service. If you have any questions about this product by Autofeel, contact us by completing and submitting the form below. If you are looking for a specif part number, please include it with your message.